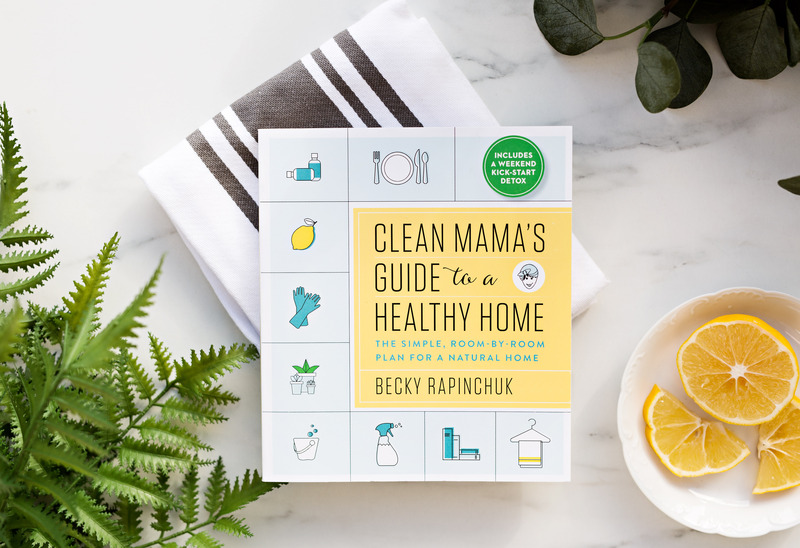 I just announced the pre-order of my soon to be released book, Clean Mama’s Guide to a Healthy Home (make sure you pre-order to get in on the incredible bonuses coming soon). I am so excited to share it with you. Through the book I guide you through my findings about what is in our homes and our daily-use products. 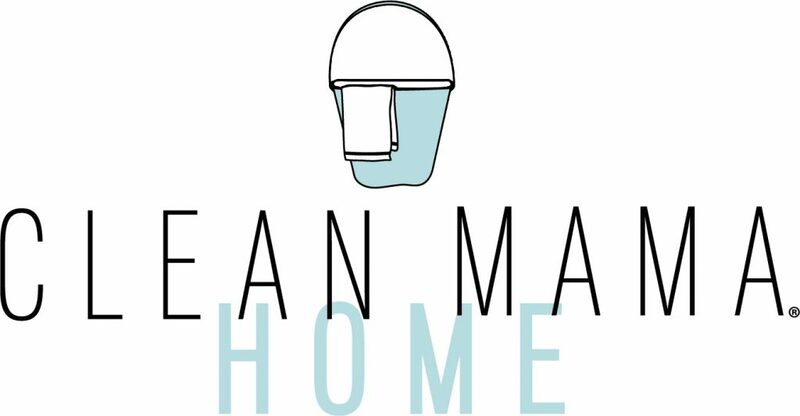 If you’ve followed along on Clean Mama you know that I am all about natural products that are truly safe for your family. Along the way I have recommended products that I believed to be 100% safe that actually weren’t. I corrected those inconsistencies and started making my own DIY cleaners as a result. You can see my DIY cleaning recipes here on the blog. I wrote a whole book on DIY cleaners back in 2014 here and a book on my cleaning routine complete with simple and safe DIY recipes – Simply Clean, 2017. 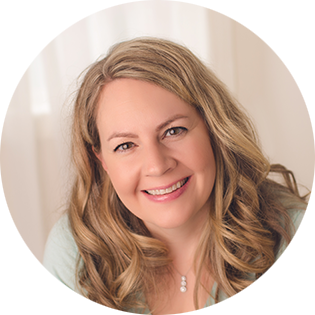 I’m really excited to share some Healthy Home Swaps with you. This is a series intended to test out known safe products and simply share my findings and opinions with you, hopefully making a swap a little bit easier. I’ll continue to test out products with the hope that you’ll consider swapping out your everyday product for a safe alternative. Today’s installment? Dish soap. You’d think any option would be safe because they come in contact with our food but guess what? They aren’t. Some dish soaps still contain triclosan (which has been banned), many others use petroleum, I recommend a plant-based soap (and any other type of cleaner). What do we have to be concerned with in dish soaps? Asthma and respiratory warnings (this is usually due to artificial fragrance and perfumes), SLS – Sodium Laureth Sulfate (cancer, nervous system damage, etc.) and other sulfates, to name a few. I used to use a very popular hand and dish soap that is marketed as clean, natural, old-fashioned but it’s not safe. Don’t just assume that something is safe because the company says it is. I’m sharing 5 options that you can purchase online and two that you can purchase at Wal-Mart and/or Target. They’re safe to use, safe to eat food off of and are rated well on EWG.org. Want to see if your dish soap is rated or how it rates? Go here. I aim for A’s when I recommend products. If you can’t find your product, you can always type in ingredients and see what they’re rated too. Why should you worry about what is in your cleaning products? You guys! There is little to no regulation on ingredients and what is considered safe so you need to do your research and decide what you are okay with. I’ll be sharing information with you in little doses here and there as I always have been but I hope you understand that you should be concerned. 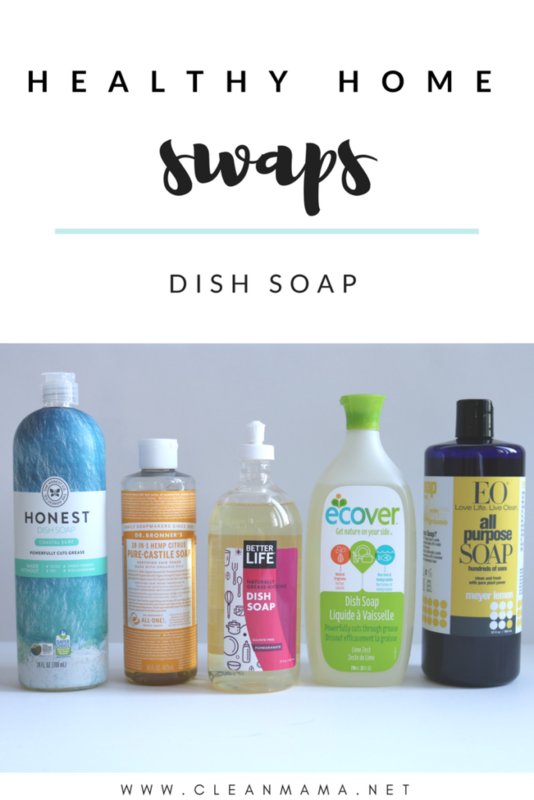 Safe dish soap doesn’t have the conventional ingredients to make it super bubbly but these options bubble up nicely and cleans even the greasiest of dishes. I’m not a fan of the scent of this soap but I really wanted to find a safe option that can be found at Target/Wal-Mart and this is it. 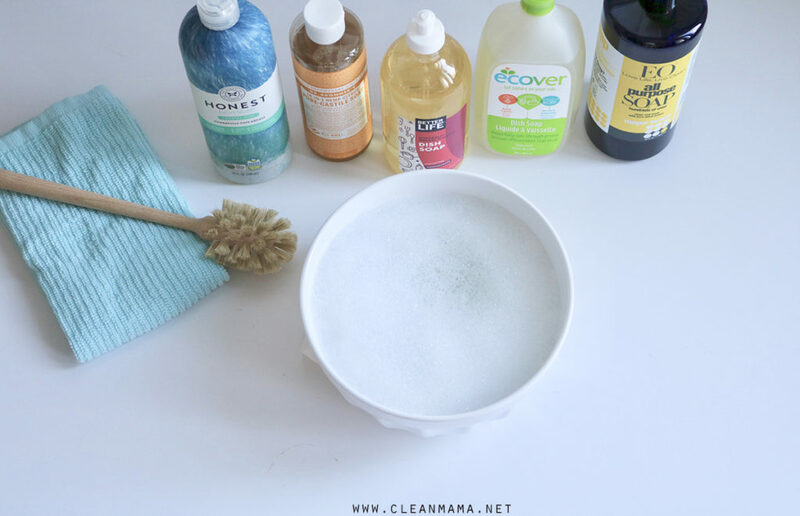 I love castile soap for cleaning and can always trust that is 100% safe for any use – you can wash fruits and veggies with it, bathe with it, and even use it to brush your teeth. I love using it as a cleaner, but it’s not my absolute favorite dish soap. The price is deceiving because it is extremely concentrated – you’ll just need a drop or two for a sink full of dishes rather than a full squirt. 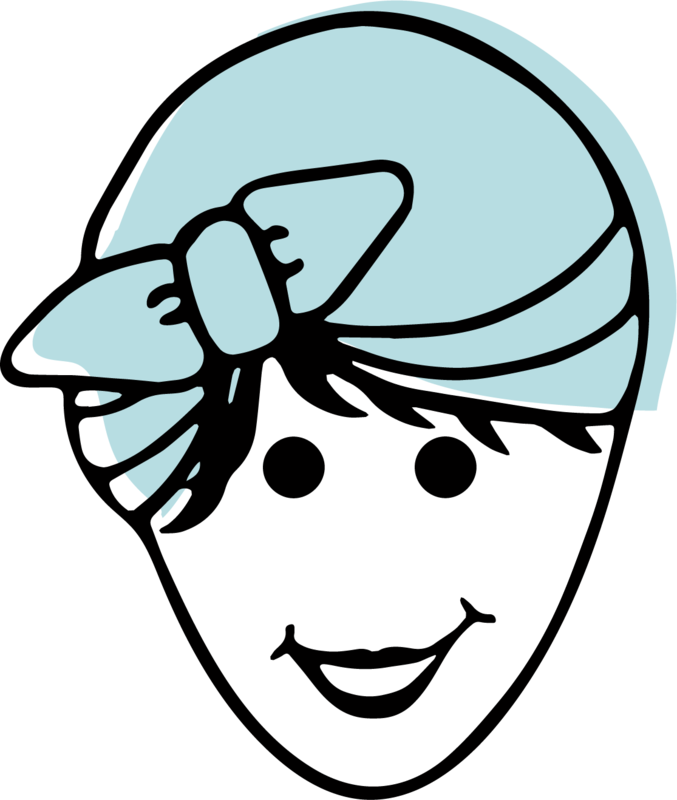 This brand is a great choice – they have an unscented, lemon mint, and pomegranate scents. Safe and effective, I definitely recommend this one. I like this option – it’s sudsy and works well but is the priciest option. This brand is my favorite hand soap and while they don’t have a ‘dish soap’, this is recommended as a dish soap and it’s wonderful. Lemon/citrus in scent and scented only with essential oils. This is a concentrate and is very concentrated – only a drop or two is necessary for a full, sudsy sink. Love that bottle brush? Me too! Here’s a link to it. The aqua bar mop towels are in Clean Mama Home! Have you ever contemplated what’s in your dish soap? Have your tried these brands? What are your thoughts? I find that Aleppo soap cleans very well and can clean dishes too. It smells a bit funky but when I’ve cleaned the floors, it looks as if I’ve buffed them too! I’m presently using Ecover and it isn’t bad at all. I buy Seventh Generation Clementine zest & lemongrass scent sold at Wal-Mart for 3 dollars. I love it. Seventh generation still has Methylisothiazolinone in it. I know I have issues with this ingredient. There’s a little mistake in the unit price of the Castile soap – it’s $.50/oz. not $.20/oz. Thanks for the info! How do you feel about Mrs. Meyers? I have heard good and bad things so I’m completely on the fence. I have been dealing w/ skin peeling on my thumbs and a few fingers. Seems to get worse after washing dishes. I use Meyer’s, which I see has a C rating. I’ll def be checking out these other options. Thanks for posting. I love that you are testing, checking ratings and sharing this. I tried the dish soap recipe in your book using Dr Bronner’s and while I loved the smell, everything dried with a film even though I rinsed well. I kept at it for a month, but I guess I’m addicted to suds too. I was always a little disappointed that the water was cloudy. Temporarily, I’m using a childhood favorite because I got nostalgic for the smell, and was going to go back to Seventh Generation. But yikes I didn’t check the rating! I bought EO body wash discounted at my Southern California Grocery Outlet. I read that it has the same ingredients as their hand soap. Now I will continue to buy one big bottle and use for body wash, hand soap and dish soap. Similar to Dr Bronbers in that it has several uses. Thanks for the info!!! I have recently made the switch to Young Living Thieves dish soap and love it!! The 6 pack of Ecover is way cheaper than the single bottle link on amazon – it actually comes out to .16 an oz. Do you have to dilute the EO all purpose soap whe using it for dishes or as hand soap? I use it straight – just a drop! Since we all use it soo often…how/where would Blue Dawn (Original) rank in your list? Or how far off the list (and why)? Thank you for putting in all the work! I love doing research on these types of products we use around the house, but don’t have the time with little ones. This is super helpful! So bummed to hear about Mrs. Meyers products. 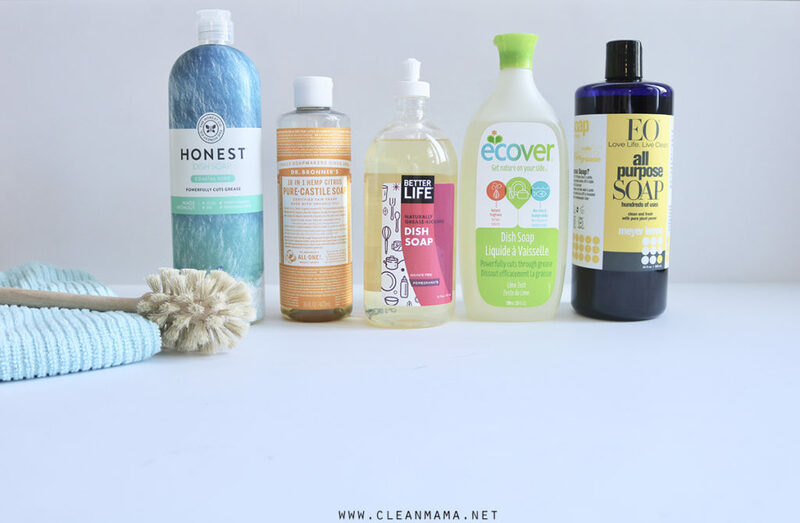 I just did the Grove Collaborative bonus that you had on your blog ☹️ Luckily, I bought Dr Bronner’s Sal’s Suds & Castile Soap – so not a complete loss. I have been using 7th generation. Thanks for the info. I will be switching to a better choice. What laundry detergent do you use? I have been using diluted Dr Bronner Sal Suds. What are your thoughts. I love the Honest dish soap!! I like either the Grapefruit scent or the Lavender Scent…. Has anyone tried ECOS dishmate? It’s rated well on EWG and inexpensive on Amazon. What do you think about products bought from direct sales companies like the dishwashing liquid from Norwex? I love the natural dish soaps, however, I feel like they don’t stay sudsy for a long time and I end up having to keep adding more and more to the sponge. This is not cost effective. In your research, which natural dish soap stays fairly sudsy? Thanks.